Between Christmas and New Year's, news came through of the death of John Cooper. It was a footnote to TV news broadcasts, but his legacy is a mammoth one. John Cooper, together with his father Charles, formed the Cooper Car Company, originally making Formula 3 cars in the burgeoning 500cc class post-WWII. The bevy of young British drivers that came through F3 in this era, led by Moss, Hawthorn and Collins, were brought up on Coopers. These tiny motorcycle-engined racers followed a lead from the pre-WWII Auto Unions in being rear engined. An early JAP-powered Cooper was entered in the Monaco Grand Prix of 1950, the second World Championship era Grand Prix, but was one of the many eliminated at an accident at the first corner. With the addition of Bristol engines, Formula 2 beckoned, and Mike Hawthorn amongst others would take the Cooper-Bristol T20 racing in the World Championship to great effect, scoring a number of fourth places marking him out as a future star. So for the 1953 season, the Cooper factory decided to chase the world title. 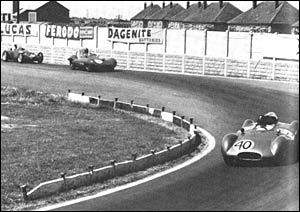 That first Grand Prix, the 1953 Argentine Grand Prix, saw the Coopers take two T20s and a new T23 half way around the world, but Cooper driver John Barber could only manage eighth in the race behind the dominant Ferrari 500s, Maseratis and Gordinis. 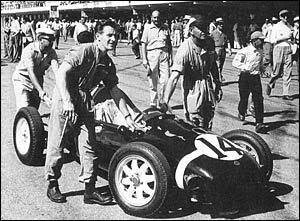 In 1954, the World Championship was again for Formula One cars instead of Formula Two as it had been the previous two years, so Cooper disappeared from the world championship while still punching out winners in F2 & F3. For the British Grand Prix of 1955 the Cooper Car Company wheeled out their first Formula One car, a the Bristol-powered T40, wrapped in an aerodynamic body reminiscent of the previous year's Mercedes W196 'slipstreamers', with the young Australian Jack Brabham driving. It was to be the beginning of a formidable partnership. 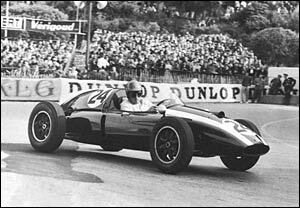 However, Cooper didn't regularly enter Formula One until 1957, with Brabham finished sixth at Monaco that year in the new T43, powered by a Coventry-Climax engine. These tiny dark green cars were yet to be taken seriously against the large front engined cars of Ferrari and Maserati. For the 1958 season Stirling Moss saw his chance to win the World Championship, but his team Vanwall, were skipping the season opening Argentine Grand Prix, so Moss arranged a deal with Rob Walker, to run his Cooper-Climax for that race. The teams speculated that their much smaller and lighter car would be much kinder on its consumables, thus being able to complete the race without any pitstops. So while the Ferraris battled it out at the start of the race, they were dismissive of the close proximity of Moss and his Cooper, as they had the power. Even when the Ferraris pitted and Moss continued, there was still no alarm. He had to pit eventually. Didn't he? Surely? By the time it dawned on the opposition that the Cooper wasn't going to pit, it was too late. Luigi Musso chased hard but finished second, as Moss had made one of the great escapes in Grand Prix history. Suddenly, these weird rear-engined Coopers were taken very seriously. Seemingly to underline the point, Rob Walker's Cooper won the next race at Monaco with Maurice Trintignant driving, after attrition struck down several of the front runners. The nimbleness and handling benefits of the smaller car outweighed its lack of power. Vanwall's car was the class of the season, but Vanwall unreliability would see Ferrari's Mike Hawthorn steal the title. For 1959, Cooper was a serious factory effort, and the combination of Jack Brabham and the Cooper T51 Climax took on the might of Ferrari and a resurgent BRM to take the World Championship. The days of the front engined Formula One car were over. Brabham backed up with a second championship for Cooper the following year in 1960. 1961 was a new era with the 1.5 litre Formula One rules, and the British teams who had stubbornly held out for continuation of the 2.5 litre rules were left behind as Ferrari swept all before them. 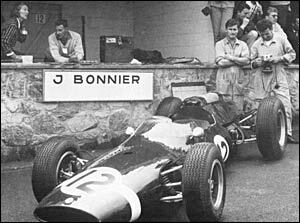 This saw the beginning of the 'garagistes', as Colin Chapman's Lotus organisation imitated Cooper, with Moss winning the 1961 Monaco Grand Prix. Unreliability plagued Cooper in 1961, and Chapman's designs proved to be better race cars, so Brabham and Bruce McLaren struggled, and Cooper's momentum was lost. McLaren would return Cooper to the top of the podium in 1962, but Jack Brabham, who had been there since the beginning as mechanic and lead driver, had left Cooper to set up his own team. 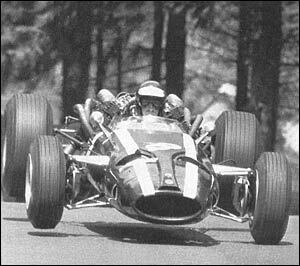 Throughout the 1.5 litre era, Cooper would continue to be thereabouts, picking up occasional podium spots, mostly with Bruce McLaren, but was generally just that little bit behind Lotus, Ferrari, BRM and later, Brabham. When the 3 litre regulations arrived in 1966 it was thought that Cooper would be one of the better prepared teams. The new T81 car would be powered by a Maserati sports car engine that was thought to be powerful enough, although a little bit heavy. Overwhelming favouritism was with Ferrari and the new Ferrari 312. 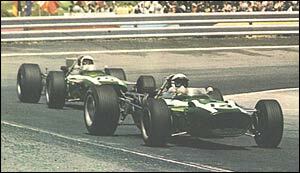 However, it would be Jack Brabham's Brabham team that would steal the beginning of the 3 litre era using a light and nimble design, in almost the same way that Cooper had done so in 1959. Cooper did pick up a win with John Surtees in Mexico, and Pedro Rodriguez at South Africa in 1967, but by 1968, Cooper were reduced to using customer BRM engines at a time when BRM themselves were starting to slip from the front rank of teams. By season's end, the team was gone, at a time when another year or two saw the widespread availability of the Cosworth DFV, which might have returned the team to competitiveness and saved the team. But the achievements of John Cooper, Charles Cooper, Jack Brabham and the Cooper Car Company in 1959 cannot be understated. It was a watershed in the history of motor racing, and the rear-engined race car revolution, begun by Auto Union back in the 1930s, was completed.